Gross margin defined is Gross Profit/Sales Price. All items needed to calculate the gross margin percentage can be found on the income statement. The margin percentage often refers to sales or profitability which may help lead to several key understandings about the company’s business model as well as how successful the company is at maintaining its cost structure to gain the proper amount of sales. Analysis of margins within a business is often useful in controlling the price in which you need to sale as well as a control on the cost associated to make the sale. Look at the following margin percentage calculation process. 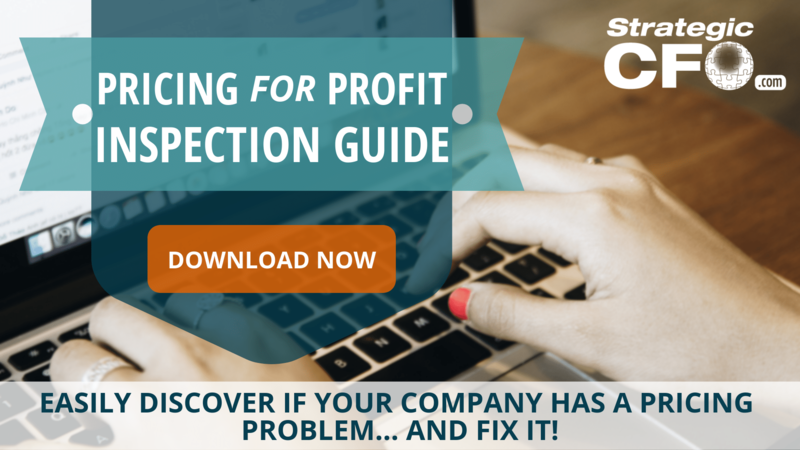 Using what you’ve learned from how to calculate your margin percentage, the next step is to download the free Pricing for Profit Inspection Guide. Easily discover if your company has a pricing problem and fix it. I have been given this calculation at work: (to get 15% of GP) I have to divide the cost price by 0.85. So, if I am needing to get 20% of GP, what would I divide the cost price by? I have a question. If 1 unit cost me $12 and I was to retail it for $25 what is the markup percentage? to get margin you divide PROFIT into Selling Price and multiply by 100. @Kevin you are correct that 52% is the Margin but (1) Ben was asking for the Mark-Up % and (2) Daniel provided him with correct calculation. Mark-up being 108%. Superb Formula. Thankx. Very much useful. I want a 100% margin. How do I ascertain the Selling Price if so? to achieve a 100% margin, your cost would have to be zero. IE; 100% of the sell price is profit. what about the taxes I incur on my selling price? Like say VAT. Where are these accounted? How I could calculate de M%, what is the formula that I can use for this… M% is Margin percent or Markup percent… Iam so confuse! Try using the margin calculator we built, hope it helps! They ran an offer of 50% off on MRP on a discount sharing of 50% each. in this case what will be my margin if original MRP is 100. How do I know the unit cost? In the example is 100 but what is the formula to obtain this value? Am staring a new business but I don’t know how to put prices on my products? So how do I calculate the unit price,what percentage should I use? Now if cost is 112500, how can we calculate sale price? as cost increases margin decreases right? for example, products i sell that cost me 20 i can retail for 40 but a item that cost me 100 probably won’t sell for 200. is there a rule of thumb to use as a guide as cost increases? If I have a customer that wants 25% margin and the sell price is fixed at 9.99 how do I work out a cost price for them? If I have a mix of Fixed and Variable costs (% of sales), what is the formula to achieve 20% profit margin? [Sum (Fixed Costs) / (1-sum(variable %)] = Breakeven; But dividing Breakeven by (1 – 0.20), doesn’t give me the 20%; probably due to variable %s. Hi, I need to determine how to keep a retailer margin whole after running a promotion. How do I calculate unit cost without knowing the quantity? I have the Total Cost (for the specific item) and the related Total Retail or Selling Price. Is there a way to calculate the Quantity using this data? If not, is there another piece of information that is needed? Can anyone have knowledge for the question below? I am studying and am busy with a calculation that just does not make sense to me. Retailer Cost Incl Vat 4681.60 and the gross margin of 16.2/3 now i am left with the calcultaion of Selling Price GP and Provit amount . Hi, i have cost of product, desired margin and discount. how can i calculate the price of product? I have total 11 products….10 products overall margin is 14% on 11th product margin is 33% so overall margin how to calculate..?? If the cost of a product is NGN100, and you want a Gross Margin of 20%, what will the selling price be?